A team of Northwestern University engineers has created a new way to print three-dimensional metallic objects using rust and metal powders. While current methods rely on vast metal powder beds and expensive lasers or electron beams, Northwestern's new technique uses liquid inks and common furnaces, resulting in a cheaper, faster, and more uniform process. The Northwestern team also demonstrated that the new method works for an extensive variety of metals, metal mixtures, alloys, and metal oxides and compounds. "This is exciting because most advanced manufacturing methods being used for metallic printing are limited as far as which metals and alloys can be printed and what types of architecture can be created," said Ramille Shah, assistant professor of materials science and engineering at Northwestern's McCormick School of Engineering and of surgery in the Feinberg School of Medicine, who led the study. "Our method greatly expands the architectures and metals we're able to print, which really opens the door for a lot of different applications." 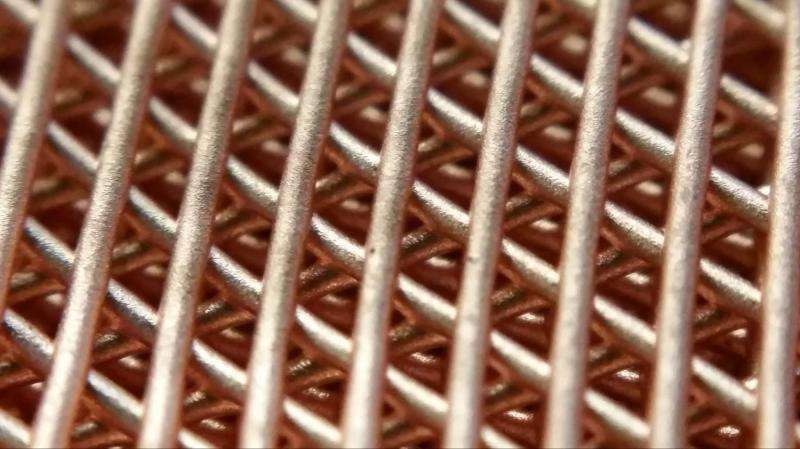 Conventional methods for 3-D printing metallic structures are both time and cost intensive. The process takes a very intense energy source, such as a focused laser or electron beam, that moves across a bed of metal powder, defining an object's architecture in a single layer by fusing powder particles together. New powder is placed on top on the previous layer, and these steps are repeated to create a 3-D object. Any unfused powder is subsequently removed, which prevents certain architectures, such as those that are hollow and enclosed, from being created. This method is also significantly limited by the types of compatible metals and alloys that can be used. Northwestern Engineering's new method completely bypassed the powder bed and energy beam approach as well as uncouples the two-step process of printing the structure and fusing its layers. By creating a liquid ink made of metal or mixed metal powders, solvents, and an elastomer binder, Shah was able to rapidly print densely packed powder structures using a simple syringe-extrusion process, in which ink dispenses through a nozzle, at room temperature. Despite starting with a liquid ink, the extruded material instantaneously solidifies and fuses with previously extruded material, enabling very large objects to be quickly created and immediately handled. Then, with collaborator David Dunand, the James N. and Margie M. Krebs Professor of Materials Science and Engineering, the team fused the powders by heating the structures in a simple furnace in a process called sintering, where powders merge together without melting. "By uncoupling the printing and the sintering, it appears that we have complicated the process," Dunand said. "But, in fact, it has liberated us as each step is much easier separately than the combined approach." The research is described in a paper published last month in the journal Advanced Functional Materials. Adam Jakus, a postdoctoral fellow in Shah's laboratory who was supported by a Department of Defense fellowship, and Shannon L. Taylor, a graduate student co-advised by Shah and Dunand who is supported by a National Science Foundation graduate fellowship, served as co-first authors. Undergraduate Nicholas R. Geisendorfer also co-authored the paper. The team imagines that many disciplines could benefit from customized, quickly printed metals. The new method could be used for printing batteries, solid-oxide fuel cells, medical implants, and mechanical parts for larger structures, such as rockets and airplanes. It could also be used for on-site manufacturing that bypasses the sometimes slow-moving supply chain. The researchers' unique 3-D inks and process open doors for more sophisticated and uniform architectures that are faster to create and easier to scale up. After the object is printed but before it is densified by heating, the structure, called a "green body," is flexible due to the elastic polymer binder containing unbonded metallic powders. "We used a biomedical polymer that is commonly used in clinical products, such as sutures," Shah explained. "When we use it as a binder, it makes green bodies that are very robust despite the fact that they still comprise a majority of powder with very little binder. They're foldable, bendable, and can be hundreds of layers thick without crumbling. Other binders don't give those properties to resulting 3-D printed objects. Ours can be manipulated before being fired. It allows us to create a lot of different architectures that haven't really been seen in metal 3-D printing." Heating the completed green bodies in a furnace where all parts of the structure densify simultaneously also leads to more uniform structures. In traditional methods that scan powder beds with a laser, the heat is localized. As powder is added on layer by layer, more heat is applied, which can create localized heating and cooling stresses, leading to undesirable microstructures and, ultimately, suboptimal properties. Using a furnace, however, ensures uniform temperature, resulting in structures that sinter uniformly without warping or cracking. "To me, as a metallurgist, I'm amazed that the structure does not deform or break apart, despite shrinking extensively during densification," Dunand said. "That is not something that I see often." Instead of one laser slowly working its way across a large powder bed, Shah and Dunand's method can use many extrusion nozzles at one time. Their method potentially can quickly 3-D print full sheets that are meters wide and can be folded into large structures. The only limitation is the size of the furnace. Another innovative component of their process is that it can be used to print metal oxides, such as iron oxide (rust), which can then be reduced into metal. Rust powder is lighter, more stable, cheaper, and safer to handle than pure iron powders. Shah and Dunand's team discovered that they could first 3-D print structures with rust and other metallic oxides and then use hydrogen to turn the green bodies into the respective metal before sintering in the furnace. "It might seem like we are needlessly complicating things by adding a third reduction step where we turn rust into iron," Dunand said. "But this opens up possibilities for using very cheap oxide powders rather than corresponding expensive metal powders. It's hard to find something cheaper than rust." This doesn't sound anything new. Shapeways has been printing in a metal powder and glue "ink" for ages. The problem with such processes is that the binder used will evaporate off when the part is being sintered, which leaves holes in the material. When printing in iron oxide for example, the oxygen and the evaporating organic glue leaving the material will have to come out, and that leaves a part which isn't entirely solid: the resulting part will be like a very fine sponge. Shapeways "solves" this problem by firing the material in the oven with a lower temperature metal such as brass or tin, which is wicked into the part exactly like water into a sponge, filling all the voids. That however means your printed part is never just one material. You can't for example make a steel rocket nozzle because it will necessarily consist of steel and a significant portion of brass, which will melt when you fire your rocket. If you leave the brass out, then your nozzle will leak.